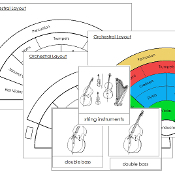 String Instruments: violin, viola, cello, harp, double bass. Brass Instruments: trumpet, cornet, flugelhorn, French horn, bass trombone, tenor trombone, tuba, euphonium. Woodwind Instruments: flute, piccolo, oboe, English horn, clarinet, saxophone, bass clarinet, bassoon, contrabassoon. Percussion: bass drum, snare drum, timbales, timpani, tenor drum, chimes, cymbals, marimba, xylophone. Cards with label are approx. 3½" x 3¼", cards without label are approx. 1" shorter. Seating charts print on 8½" x 11" letter size paper. Copyright © 2004-2019 Montessori Print Shop. All rights reserved.